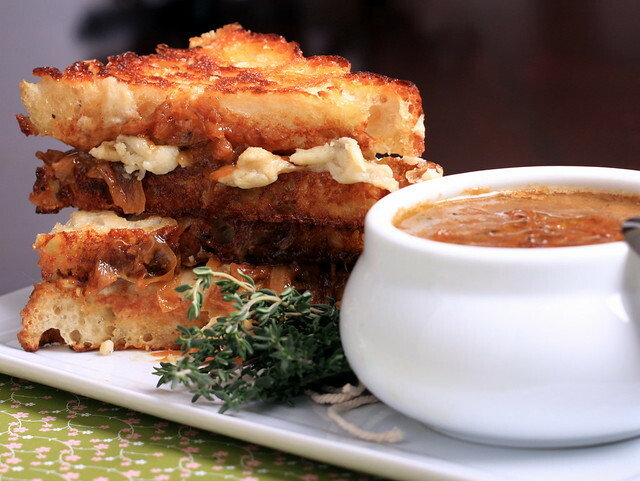 This is a fusion of two dishes I’ve made before—vegan french onion soup and vegan grilled cheese—which happen to go together perfectly. The deeply caramelized onions have a unique dark sweetness to them, and the addition of sherry and thyme gives a hint of acidity that is nicely balanced out by rich and melted vegan cheese. I loved everything about this dish, from sweating and caramelizing the onions for almost two hours (it smells amazing) to melting the cheese on toasted fresh focaccia bread, to dipping the sandwich in the soup, to savoring each sloppy bite. Combine all of the cheese ingredients except for the nooch in a small saucepan. Whisk briskly continuously until the mixture comes to a boil. Remove it from the heat, stir in the nooch and transfer it to a small pyrex dish. Cover and chill in the refrigerator for an hour. Start by slicing the ends off of the onions and peeling them. Slice them vertically in half, then slice each half thinly into half-moon shapes. In a large dutch oven, melt the Earth Balance over medium-low heat. Add in the onion and sprinkle with some salt. Cover and let them sweat for 45 minutes. Uncover, stir and sprinkle with a little more salt. Allow to reduce and caramelize for 45 minutes to an hour more, stirring no more than two or three times, to allow the color to deepen. Sprinkle the onion with flour and stir well for about a minute. Add in the sherry to deglaze the pot, then stir to combine. Allow to simmer for 5-7 minutes more, then remove about 1/2 cup of the onions and place to the side. Return to the soup, and then throw in the thyme sprigs and bay leaves. Slowly pour in either the vegetable stock along with the Not-beef bouillon cube or the mushroom stock. Simmer for about 10-15 minutes more. While the soup is simmering, heat a skillet over medium-high heat. Remove your cheese from the refrigerator and mash it around with a fork. Spread a thin amount onto a piece of focaccia. Place a little Earth Balance onto the hot skillet, then place the focaccia on top of that, cheese side up. Once the focaccia is toasted, quickly flip it over to allow the cheese to slightly melt, only a second or two, then spoon some of the reserved onions over the top. Toast another piece of focaccia, then place that on top of the sandwich. Return to your soup, remove the bay leaves and thyme, and transfer to crocks or small bowls. Serve immediately with the hot sandwiches. That looks amazing! I have been meaning to make FOS and this making me want it now!! Where do you get your focaccia? Thanks Jen! I get my focaccia at Whole Foods. Oh my….this looks so good. I'm going to make this tonight. I hope you enjoyed them, Eileen! Ok, now I finally put your onion soup on our meal plan. It looks so comforting and I bet it tastes perfect. 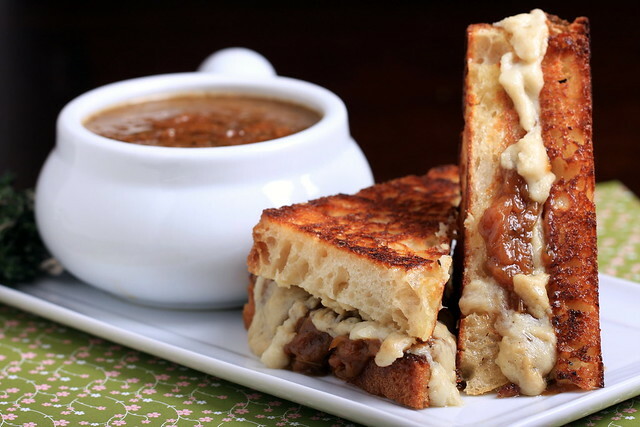 growing up, i LOVED ordering french onion soup when we went out to dinner. how creative to make it into a sandwich! it looks out of this world scrumptious. I am new follower of your blog and I live in a rural area in the south and we are limited with the ingredients that I can buy locally. I know I can buy online but money is limited most of the time but for a cheese that is unprocessed I might just make the plunge. So, what is nooch? Hi Jessica! Nooch is nutritional yeast, a deactivated yeast that has tons of B12 in it. It tastes super-cheesy and is great for adding to vegan cheeses and sauces. Look for the large-flake variety for better taste and quality. I had not heard it put that way, "Nooch". I hope to try this soon – nice comfort food. OMG, amazing!!!!!! Love it! I am drooling. . I've never seen coconut vinegar – can I sub some other kind of light vinegar? This looks sooooo good. Meg, If you have access to an asian grocer, you should be able to find the coconut vinegar there, but I have seen it at Whole Foods as well. It has such a unique flavor that really contributes to making this taste cheesy so I'm not sure what results you've have with another vinegar. Someone else made this cheese with white balsamic vinegar that she said tasted good, so maybe give that a try if you can't find any CV? Clearly, we are on the same wavelength. You make an amazing soup into a soup/sandwich combo of the vegan gods and I made a sandwich into a soup bowl. ha ha! Yours seriously looks amazing, Erin. I'm drooling right now! Wowza! Incredible Girl! That looks so delicious! I still can't get my cheese to firm up with such a small amount of agar. Blast! I think you are exactly right!!! coconut vinegar? saw the post above and will hunt for it! thanks! A little confused on this part of the directions: "Slowly pour in the stock and add the Not-beef bouillon cube or the mushroom stock." Is it cube or mushroom stock OR if no cube, then use mushroom stock in lieu of veggie stock and the cube? The broth base you use for this recipe will either be the vegetable stock, plus a bouillion cube or just plain mushroom stock. I updated the directions to make that more clear — enjoy! Hallelujah! LOL! I'm obsessed with the vegetarian french onion soup at a take out place here… but we're moving next year! Now I have a yummy recipe to try… Thank you!! where do you find coconut vinegar and will guar gum do instead of the agar? You can find coconut vinegar at most Asian markets and at Whole Foods. I haven't ever used guar gum, so I can't say for sure if it would work or not. Glad you liked these cheese Christine, and thanks for giving it a try! I haven't experimented with other spices and flavors with this type of cheese yet, but I like your idea of adding turmeric/paprika! Sara, I really love Imagine brand's Mushroom stock for this soup — it's super rich and complex, and tastes perfect with the other flavors. Enjoy! This should make two sandwiches and two huge bowls of soup. I don't typically include serving counts on my recipes, because my husband eats HUGE portions, and I eat much smaller portions frequently throughout the day, and as leftovers at work, so it's hard to put an accurate count on that. Saw this on Finding Vegan- wow! Can't wait to try it. Thanks! You can find this in both places. It's typically with the other oils and vinegars — it's a great ingredient to have on hand! would this vegan moz. cheese do well on a pizza??? This looks amazing! Your blog is fantastic! So glad to find it! This cheese recipe worked wonderfully! I subbed corn starch for tapioca flour and it turned out fine, but not as stringy-melty as it might have with another thickener. thanks for your feedback and glad you enjoyed, racheyalex! Bless you for posting this! I saw this in a e-newsletter today. It looked so delicious that I made it tonight. The sandwich is DELICIOUS, even to my non-vegan hubby. I messed up the soup because I thought I had sherry but instead had sherry vinegar. I cut the amount for sherry in half, but it's still to vinegary. I'll get some sherry and will make this again. The cheese is amazing! Yikes! That's a lot of vinegar. : ) So happy that you and your husband enjoyed the cheese! Well, I did it right this time, and it was spectacular! Thanks for giving it another go, and so glad you enjoyed, Thisby! I made this several weeks ago to rave reviews! It was delicious. I am making just the cheese today to put into quesadillas. Happy Cinco de Mayo! So happy it was a hit! Using this cheese in quesadillas sounds fab! I have read that most sherry is non vegan, which brand do you use? This looks amazing! Think I could make the soup the night before? Absolutely! This reheats very well — you may need to add in a little more stock during reheating, as it may thicken a bit. This looks utterly delicious – I've pinned it, and saved it to my computer- I can smell it already! This looks so good. I can't tell how many sandwiches the cheese will make though. I'm not sure if I should double it. It should make enough cheese for 2-3 sandwiches. I hope you enjoy!